We review the general theoretical concepts and observational constraints on the distribution and evolution of water vapor and ice in protoplanetary disks, with a focus on the Solar System. 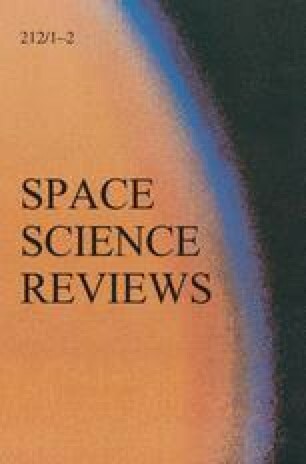 Water is expected to freeze out at distances greater than 1–3 AU from solar-type central stars; more precise estimates are difficult to obtain due to uncertainties in the complex processes involved in disk evolution, including dust growth, settling, and radial drift, and the level of turbulence and viscous dissipation within disks. Interferometric observations are now providing constraints on the positions of CO snow lines, but extrapolation to the unresolved regions where water ice sublimates will require much better theoretical understanding of mass and angular momentum transport in disks as well as more refined comparison of observations with sophisticated disk models. The research of L. Hartmann was supported by the University of Michigan and in part by NASA grant NNX16AB46G. F. Ciesla acknowledges support from NASA’s Exobiology and Outer Planets Research Programs (NNX12AD59G and NNX14AQ17G). O. Gressel has received funding from the European Research Council (ERC) under the European Union’s Horizon 2020 research and innovation programme (grant agreement No. 638596). R. Alexander has received funding from the European Research Council (ERC) under the European Union’s Horizon 2020 research and innovation programme (grant agreement No. 681601), and also acknowledges support from the Leverhulme Trust through a Philip Leverhulme Prize.